FANBOY PLANET.com . : dcc-birth-of-dcc :. The Birth of the "Dynamic Cosplay Couple"
The Dynamic Cosplay Couple at NYCC, photo by Nerd Caliber! Sean and I met as most couples do – in an LGBT nightclub. When we began to date our geekiness came out and we quickly realized that we were two nerds meant for each other! Now, almost four years later we are engaged and planning a geektastically glamorous wedding. As for the birth of the “Dynamic Cosplay Couple,” both of us grew up loving makeup and costuming, but we didn't really know of the “cosplay” world. Instead we just found events (ie: Renaissance Faire) or reasons (ie: birthdays) to dress up in costume. Our first official “cosplay” endeavor began almost two years ago at Fanime in San Jose. And we fell in love with the whole cosplay world! Once I got the call that I WON A VIP ALL EXPENSE PAID TRIP to NY COMIC CON we knew we had to pull out all the stops! Our form of cosplay is a mixture of upcycling, creating, crafting, purchasing, and makeup. But our creations and looks stem from our own crazy brains. Going to the convention in New York was a dream come true for geeks like us, and experiencing the show as cosplayers was different from normal con attendance. First of all, we couldn’t walk 50 feet before being stopped for at least 15 minutes for pictures. Awesome and flattering, but we pretty much gave up on attending panels that were on the other side of the convention hall. One of our favorite moments was visiting the Mattel booth as the Monster High characters, Robecca Steam and Hold Hyde, where we were introduced to the CREATOR of Monster High! He was happier to meet us than we were to meet him! As fabulous as this moment was it doesn’t compare to the wide-eyed children who looked up at us and told their parents, “They do exist.” Then wandered over to us in disbelief for their parents to take pictures of them with us. 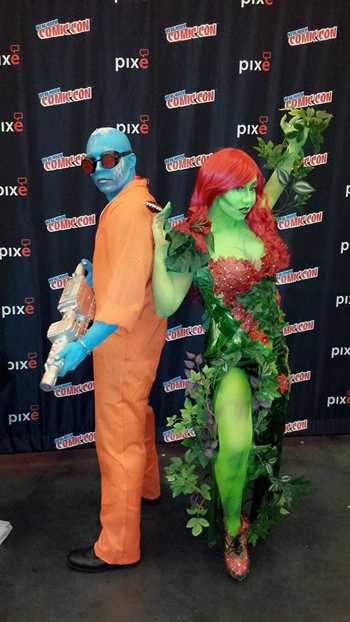 We deem ourselves amateurs, but are extremely proud of our latest and greatest looks, which we created over the one and a half weeks leading up to our trip to NYCC – Poison Ivy and Mr. Freeze. So much better than in Batman and Robin! Make-up was a huge part of these cosplays. For our body painting and make-up we took at least three hours to accomplish both of our looks. 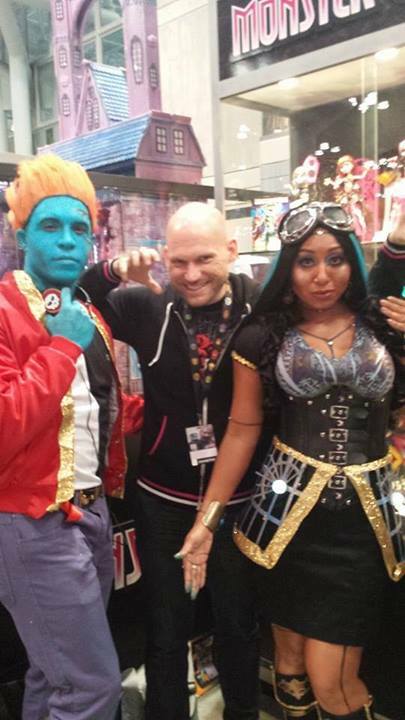 As much fun as we knew we would have at NYCC, we also realized that this was a way to network and make new connections. So we birthed the idea of the “Dynamic Cosplay Couple” – where we created social sites and an email address for people to connect with us! We had business cards made and that was THE BEST IDEA EVER. Instead of having to swipe my email address into a photographer's phone, we were able to pass out our cards to everyone and anyone! Sean and I realized that we wanted to show people that those of us with full-time adult jobs, families, and limited extra time can still PLAY – cosplay! These things should never stop people from uniting your powers with your loved ones and allowing each other to be creative and crazy - together.